MiFID II alone has generated 30,000 pages of regulatory text. The complexity of the task facing these practitioners in understanding and interpreting the volume, variety and velocity of regulation and capturing this knowledge cumulatively and systematically is nothing short of daunting. As MyComplianceIQ points out “ignorance is no longer bliss – in fact, it just became a criminal offence. And, no matter how much an organisation invests in technology to address areas of its financial crime framework, it will always be the presence of employees who really understand the subject matter that will make the difference between a control that is effective and one that is not”. A significant hurdle for compliance teams is how they justify the investment spend in new technology to senior management and prove to their seniors that the cost/benefit equation will actually work. Furthermore, given the maturity of these solutions, how do they assess start up viability or where and how to adopt the RegTech within the organisation? We are seeing some positive initiatives being introduced by regulators and financial institutions in the form of ‘proving grounds.’ They are allowing start-ups to undergo a test in real-world conditions. So, there is no lack of desire for change. Identifying the right players is a first natural step for many organisations when making a major purchase decision. And up until the introduction of this yearly report, there has been no resource that accomplishes this in any factual way. In addition, many of these regtech solution providers are privately held, and privately held companies aren’t required to report their revenue publicly and revenue is not broken down by product. Are firms struggling to deploy new regtech effectively? Where will we see the next major regtech innovations? What will the future hold for regtech firms? The report authors have developed a custom formula that was used to rank the solutions in the overall ranking and for each category and section. The formula is based on year established, number of users, global deployment, and product go-to-market dates. Most significant barriers to regtech adoption. Next major innovations in regtech. Ignorance is no longer bliss. In fact, it just became a criminal offense. Making laws and regulations SMART using regtech. Points of view: views on innovation and barriers to market from global regtech firms. Time from lead to production live. 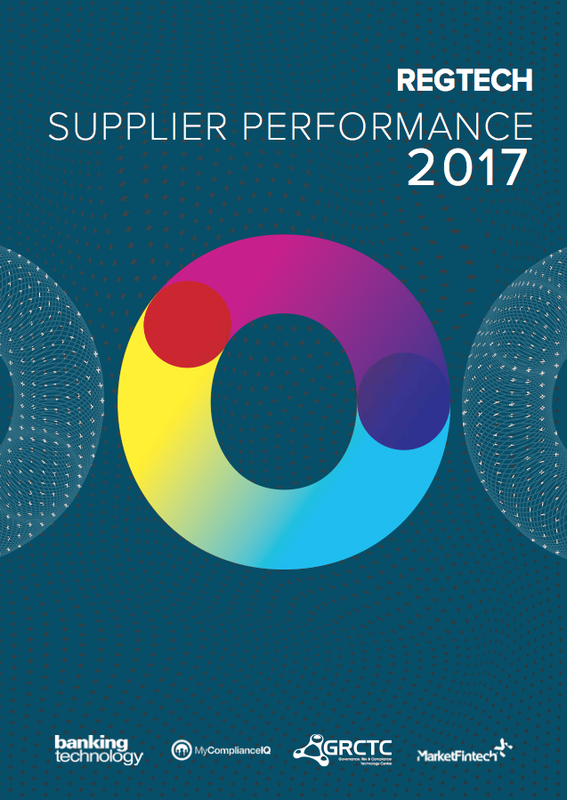 Please fill out the brief form below to purchase the Regtech Supplier Performance Report 2017. The 2017 report costs £850, or you can purchase the 2016 and the 2017 reports together as a bundle for £995. Just a couple of clicks, a payment, and the report is all yours! By filling out this form you agree to share your details with Market Fintech Limited. Synthesise holistic wisdom from core systems and not just from channel silos. From depth of analysis, ease of configuration/implementation and cross-channel fraud detection to insider fraud detection and real-time high availability, a synchronised enterprise fraud risk management approach delivers five compelling advantages over a delivery channel silos only approach. With more and more regulations being added and enforced, how can companies keep up? Fenergo CLM will be rolled out across Natixis’ Corporate and Investment Banking division globally.